The PFT-302CE AC hipot test set provides continuously adjustable output voltages for overvoltage withstand testing of switchgear, circuit breakers, reclosers, vacuum bottles, hot sticks, motor windings and other high voltage insulation requiring AC testing. The PFT AC Dielectric Test Set Series are AC portable field use hipots. 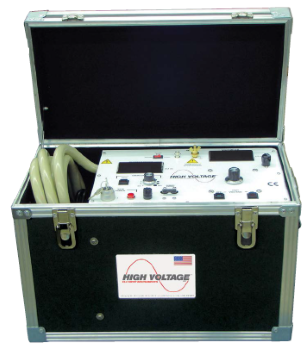 These hipots provide continuously adjustable AC voltage typically used to provide a pass/fail, AC over-voltage withstand test on high voltage apparatus, like switchgear, circuit breakers, reclosers, vacuum bottles, hot sticks, motor windings, bus duct, and any other equipment needing an AC voltage proof test. The PFT Series offers the most field portable, affordable, and easiest to use AC testers at this voltage and power. Higher kVA AC test sets and others designed for motor & generator testing are also available.